Image caption Hungarian government poster: "You too have a right to know what Brussels is preparing!" A Hungarian government campaign accusing the European Commission of supporting illegal immigration is "fake news", a Commission spokesman has said. Margaritis Schinas said the campaign, launched on the government's Facebook site, "beggars belief". 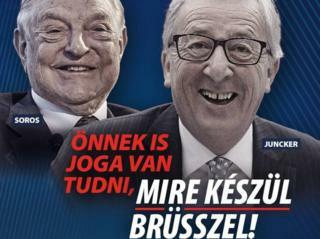 Campaign posters feature Commission President Jean-Claude Juncker and the Hungarian-born billionaire George Soros, a vocal critic of Hungary's right-wing Prime Minister Viktor Orban. European elections will be held in May. Immigration from non-EU countries has become a major issue across the 28-nation bloc. Mr Orban, with support from neighbouring Poland, the Czech Republic and Slovakia, rejects a Commission scheme to distribute asylum seekers EU-wide, to ease the burden on Italy and Greece, where migrant holding centres remain overcrowded and squalid. Nationalists - gaining ground in much of Europe - especially object to EU efforts to integrate Muslim migrants. Mr Orban and others argue that mass immigration from outside Europe threatens "Christian" culture. Besides economic migrants, there are many refugees from wars in Afghanistan, Iraq and Syria. International law grants refugees a right to asylum. Mr Orban's spokesman Zoltan Kovacs said "Brussels continues to want to support illegal immigration, which is something the Hungarian people must know about. "The plans aimed at supporting migration are still there in the 'Brussels drawers', and decisions are being made in the background that are aimed at realising these plans," he said. The EU wants to bring in mandatory migrant settlement quotas and a migrant visa, and weaken members' rights to border defence, he alleged. However, the Commission spokesman denied each of those claims. "It's shocking that such a ludicrous conspiracy theory has reached the mainstream to the extent it has," Mr Schinas said in Brussels. The Orban government has targeted Mr Soros in previous campaigns, condemning his funding of civil society groups that help migrants or defend human rights. Mr Soros, a Jew who narrowly escaped the Holocaust in his youth, was attacked by the government previously with the campaign slogan "Don't let Soros have the last laugh". Critics accuse the Orban government of anti-Semitism in its vilification of Mr Soros.